A detailed itinerary has yet to be confirmed, as well as whether they will meet US President Donald Trump, the official told reporters. SEOUL/WASHINGTON: Two senior South Korean officials who met with North Korea's Kim Jong Un this week will depart for Washington on Thursday to brief US officials on the outcome of their meeting, a South Korean administration official said on Wednesday. 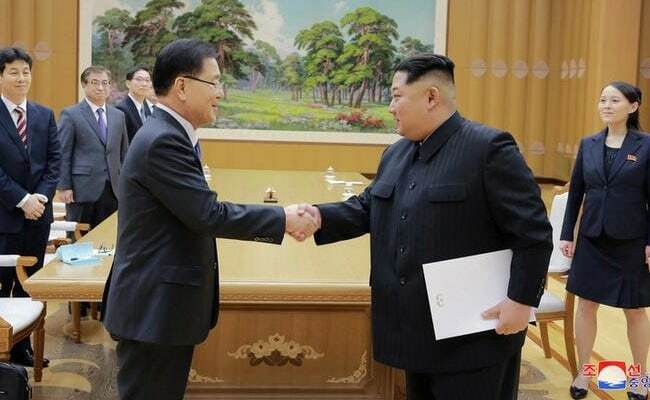 National Security Office head Chung Eui-yong, who has close contacts in the United States, and National Intelligence Service chief Suh Hoon, who is known as South Korea's top North Korea negotiator, will be making the trip. Chung said on Tuesday he had a message from Kim Jong Un he will relay to US officials. The US State Department said on Tuesday that the United States and South Korea are discussing holding a meeting later this week about potential denuclearisation talks with North Korea. "The State Department has been speaking with the White House about the proposed upcoming meeting later this week," State Department spokeswoman Heather Nauert told a briefing. "In terms of the meeting with South Korea and also with the DPRK (North Korea), we don't have a play-by-play of that just yet. We will wait for the Republic of Korea (South Korea) to come to Washington to be able to brief us on those meetings." Chung cited North Korea as saying it would not carry out nuclear or missile tests while talks with the international community were under way. North Korea has not carried out any such tests since last November. North Korea is also willing to discuss normalising ties with the United States, Chung said. North Korea seems "sincere" in its apparent willingness to halt nuclear tests if it held denuclearisation talks with the United States, President Donald Trump said on Tuesday as US, South Korean and Japanese officials voiced scepticism about any discussions.